After being spoiled with mild temperatures in December, old man winter sure made his appearance in January. After several snow storms this month, we are now facing an Arctic blast of cold air and have had wind-gusts up to 50 mph or more. Hopefully, it will be in and out quickly, with much warmer temperatures ahead for the weekend. In La Harpe, school was cancelled 4 days last week due to the snow and ice and drifting roads, and it will be cancelled again on Wednesday, January 30 due to the dangerous wind chills. At West Central, school was cancelled all but four hours last week and so far, every day this week with hopes that maybe, temperatures will rise enough to allow school to open by the end of the week. Many other schools and businesses are also closing today "Wednesday, January 30" when temperatures are to dip to its lowest, possibly -19 degrees below zero with an added -20 degrees below that after adding the wind-chill factor. According to weather advisors we have been receiving at The Quill, frost-bite can happen within 4 minutes at these temperatures and people are told to keep everyone inside including pets. To help avoid busted water pipes, keep faucets slowly dripping or running and keep your heat at 50 degrees or above. We send much appreciation to farmers, police, and emergency workers, road crews, and numerous other outside workers who have to continue to brave this extremely dangerous and cold weather. Stay safe everyone, and enjoy the beauty of the snow from indoors this week! 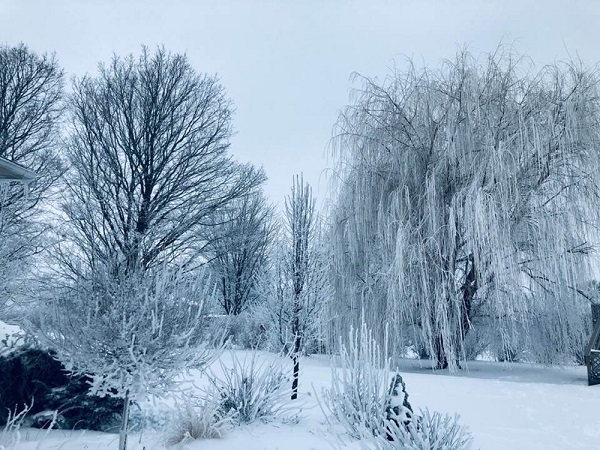 As temperatures keep falling, we marvel at this beautiful snow picture taken January 14 by Laurie Myers of La Harpe. This is what they call "Hoar Frost" where liquid dew freezes with a drop in temperature and creates ice crystals.